“For many years I have featured my burnt and restored banknote routine “LemonAid” However I have noticed, especially when working on cruise ships, a lot of people no longer carry cash! The obvious answer is a strong effect that features a credit card. “Taking Credit” is my response to this development and it has become one of my favorite magical routines. More importantly it has become a huge success with my audiences also. 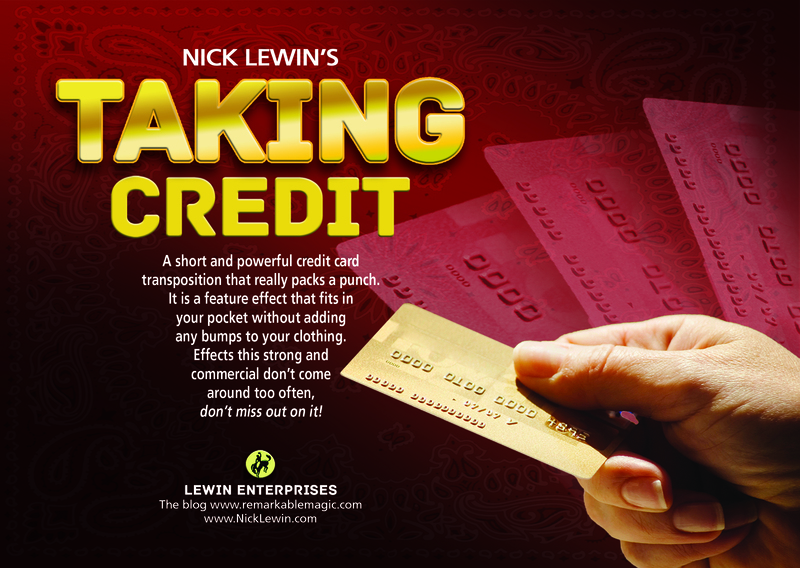 Taking Credit is a short and powerful credit card transposition that really packs a punch. This is one of those rare effects that can be performed in a living room or a large theatre with equal impact; it is a feature effect that fits in your pocket without adding any bumps to your clothing. The latest addition to Lewin’s acclaimed “Pack Small—Play Large” series. 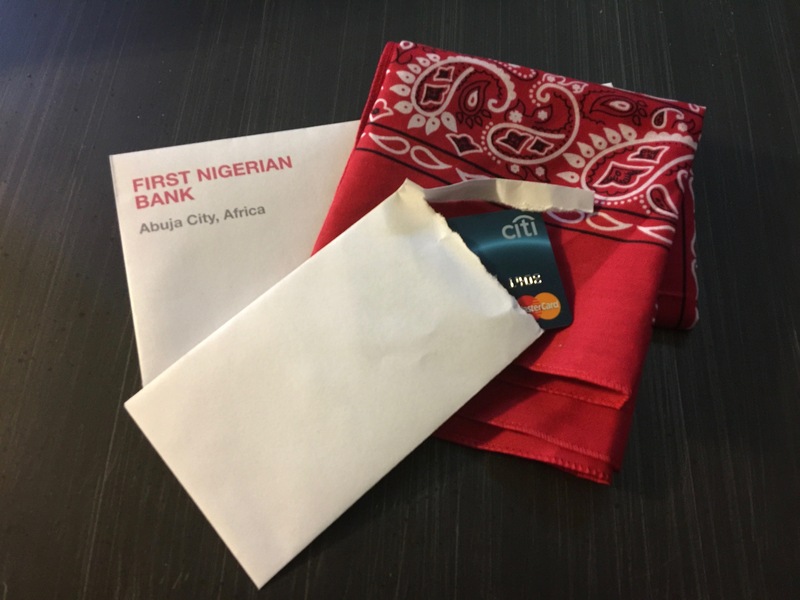 This routine comes complete with everything needed to perform it: a detailed DVD, uniquely constructed bandana, specially printed envelopes, plus an additional secret gimmick that is destined to become a classic utility prop. The DVD contains two different handlings, full patter and detailed instructions on the “LeNick” envelope — a modern day classic tool for the working magician. Nick has featured this routine in his show for twenty years and can teach you how to slot it into your show quickly and highly effectively. The DVD even explains the three trick sequencing that makes it such a stand out in Nick’s professional show. Effects this strong and commercial don’t come around too often, don’t miss out on it! 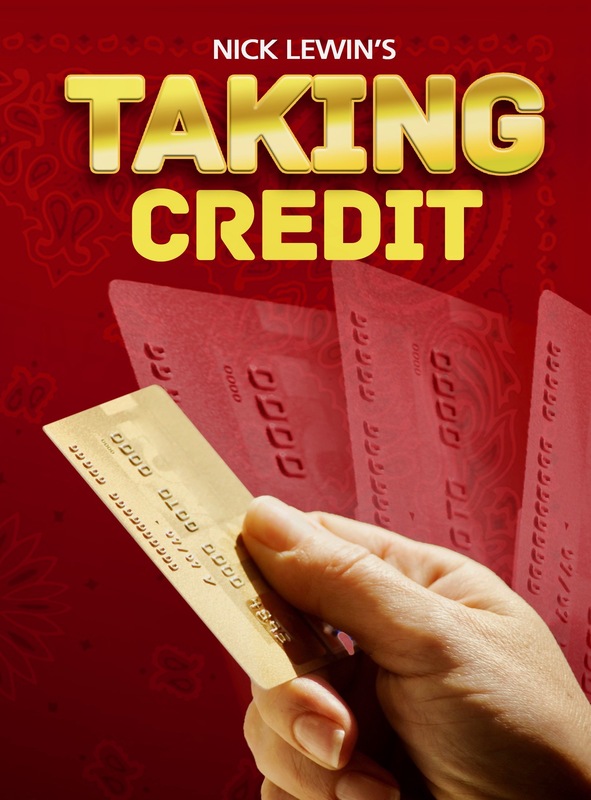 “Just got my copy of “Taking Credit” in the mail last night. I took a couple of hours to go through it and watch the video. I have studied most of the effects of this kind that have been published, including the great Billy McComb’s work. The bandana solves the problem I had with Billy’s original routine, which was that awkward moment when you have to do the work and they are burning you. Now it’s a non-moment, which is what you want. This is the most direct, effective handling and presentation I have ever seen. I cannot wait to add it to my show. My only question can I use it anywhere but as a closer, because I just don’t see how anything can follow it!” — Eric Henning.